The BSE Sensex closed 363.05 points, or 1%, down at 35,891.52, and the Nifty 50 ended 117.60 points, or 1.08%, lower at 10,792.50. Jet Airways shares traded 4.68% lower at Rs 267.90 per share. Intraday, the stock fell as much as 5.7% to Rs 265 per share. Jet Airways said on Tuesday that it defaulted on debt payment to a consortium of Indian banks, prompting ratings agency ICRA to downgrade the carrier and sending its shares sharply lower. The payment of interest and principal instalment was delayed “due to temporary cash flow mismatch”, Jet said in a statement, adding that it was in talks with the consortium led by State Bank of India. The deadline for payment was Monday, Dec. 31.ICRA cut Jet’s long- and short-term ratings on Wednesday, citing the payment delays. Timely implementation of liquidity initiatives, including equity infusion and a stake sale in the airline’s loyalty programme Jet Privilege, will be critical to the company’s credit profile, ICRA said. Shares of Eicher Motors Ltd fell over 7% today after the company said total sales of its Royal Enfield two-wheeler division declined 13% to 58,278 units in December, compared to 66,968 units in the same period last year. Eicher Motors shares slumped as much as 7.5% intraday to Rs 21,455 per share on the NSE. At 2.02pm, the stock traded 7.4% lower at Rs 21,478.95 per share, whine the Nifty 50 Index was down 144.95 points at 10,765.15.“This weakness in demand might continue in near future, considering the substantial increase in cost of ownership (insurance, rear disc brake and ABS related) and Jawa has emerged as a reasonable alternative for potential RE customers,” said Motilal Oswal in a research note. The brokerage lowered volume estimates for RE for FY19/20 to 846k/919k. It maintained a “buy” rating on the stock, with the TP of Rs 24,760 per share. The rupee fell sharply today against the US dollar amid weak domestic equities. The rupee hit a low of 70.02 against the US dollar in the afternoon trade, down 58 paise from its previous close of 69.43. The currency opened at 69.63 a dollar, and hit a high of 69.55. The rupee had appreciated by 34 paise on Tuesday to hit a five-month high against the US dollar. 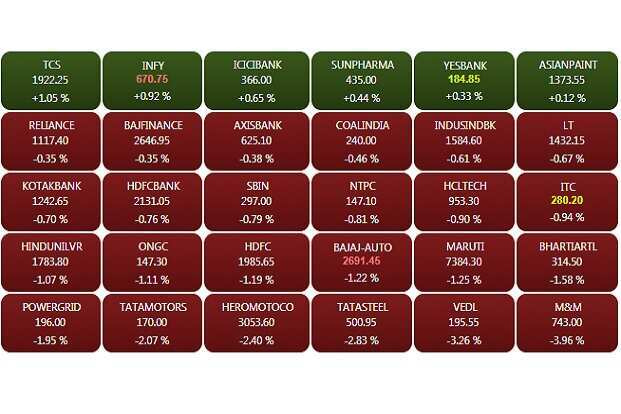 The BSE Sensex fell 223.24 points, or 0.62%, to 36,031.33, and the Nifty 50 was down 67.70 points, or 0.62%, to 10,842.40. The BSE midcap and smallcap indices declined 0.47% and 0.17%, respectively. 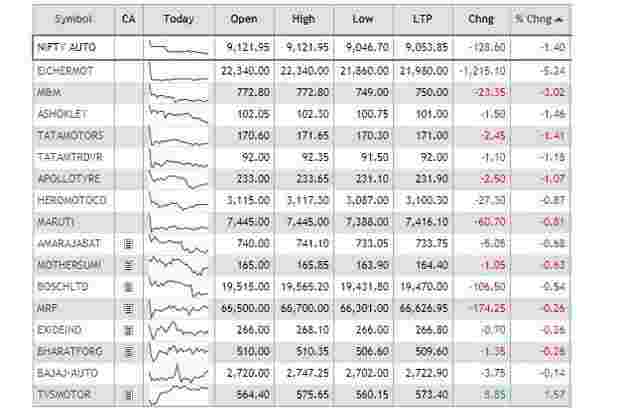 Barring IT and teck, all the sectoral indices on BSE traded in negative territory with metal and auto losing over 2%. Consumption, utilities and oil and gas fell over 1%. IT an teck rose around 0.5%. Hero MotoCorp Ltd said its December total sales fell 3.9% to 453,985 units from 472,731 units last year. The company said its cumulative sales in the nine month period rose to 6,037,901 units. Chairman Pawan Munjal said increased insurance costs ahead of Diwali and prevailing liquidity situation affected growth momentum. “The cost of two-wheelers will further go up once the new set of regulations around safety comes into force, followed by the transition to BS-VI emission norms,” he added.“Given that two-wheelers provide basic mobility to the masses, there is an urgent need to reduce the GST rate on two-wheelers from the 28% bracket of ‘luxury goods’ to that of 18% for mass usage items,” said Munjal. Shares fell as much as 2.5% to Rs 3050 per share. NMDC shares rose as much as 3.9% to Rs 99.50 per share after the company on Tuesday said it board will consider a share buyback proposal at a Jan 8 meeting. 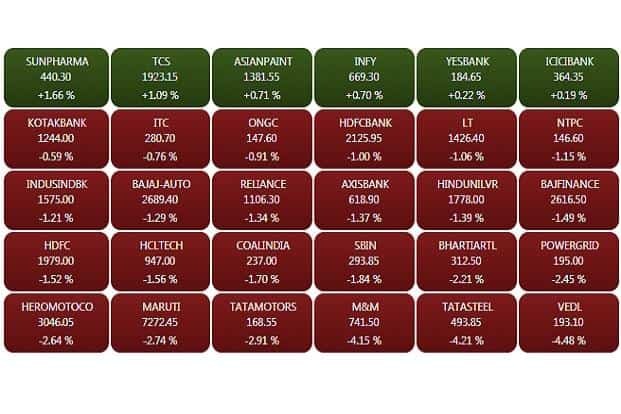 Shares of auto companies traded lower, with the Nifty Auto Index falling over 1%, following lower-than-expected vehicles sales data for December 2018 despite the festival season. Eicher Motors shares fell over 5% and M&M declined over 3%. Ashok Leyland and Tata Motors fell over 1%. Eicher Motors shares fell as much as 5.65% to Rs 21,873.25 after the company’s total motorcycles sales declined 13% to 58,278 units in December 2018, from 66,968 units last year. December total exports rose to 2,252 units compared to 1,601 units a year ago.Eicher Motors on Tuesday said it sold 6,113 buses and trucks in December 2018 as compared to 5,995 units in the year-ago period. According to Eicher, Volvo Trucks India’s sold 123 vehicles in the month under consideration as against 132 vehicles last year. Jet Airways shares fell as much as 3.39% to Rs 271.50 per share after the company disclosed that it has delayed the payment to a consortium of Indian banks, led by State Bank of India. The payment of interest and principal instalment was delayed “due to temporary cash flow mismatch” and the company is in talks with the consortium. The deadline for the payment was Dec. 31, 2018, Jet said in a statement. The Indian rupee weakened against the US dollar as dealers are concerned about slowing global growth and foreign fund outflows from Indian debt and stock markets. At 9.10am, the rupee was trading at 69.59 dollar, down 0.23% from its previous close of 69.44. The currency opened at 69.63 a dollar, touching a high 69.55 and a low 69.64. The 10-year bond yield stood at 7.397%, from its Tuesday’s close of 7.418%.